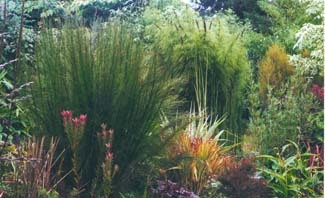 Exotic garden with over a hundred species of bamboos and vegetables grown free of chemicals. To garden with a single plant family is a magnif-icent obsession. 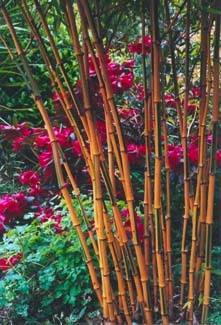 While many gardeners reserve the best spot in the garden for the object of their particular passion, Robin and Janet Stonard have a whole two acre garden devoted to bamboos. They began collecting 40 years ago, long before the various genera became fashionable. When the Stonards retired and moved to Cork in ‘98 the collection came with them. And in spring 2000 their two acre plot was planted with over a hundred species, varieties and cultivars, representing 18 different genera. The bamboos were displayed to show off their individual habits around grass and gravel paths. 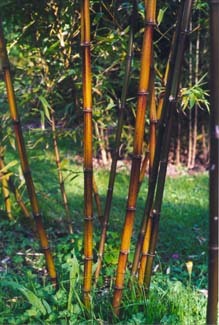 The whispering swaying collection includes both the rare and the new, with introductions like Roy Lancaster’s Chinese find Fargesia denudata, with yellow green foliage and a weeping habit, or the striped version of the black bamboo Phyllostachys nigra ‘Megurochiko’, found only on the island of Awaji. Other plants are now beginning to sneak into the scheme of things, particularly leptospermums, pittisporums, acacias and restios. There is also a chemical free vegetable garden, where ingenious methods include growing strawberries in hanging baskets to foil slugs. To see the sheer variety in texture, colour and habit of bamboos ranging from Bhudda’s belly (Bambusa ventricosa) to the small invasive yellow striped Sasaella masamuneana aureostriata from Japan is a revelation and the Stonards are extremely knowledgeable. From west end of Skibbereen N71 bypass, take exit signed NCT centre. Take left fork after 2.5 miles; take second left after 0.5 mile into narrow lane; the garden is 0.5mile on the right.